When he was "five or so," Smith was introduced to surfing by his uncle, John Smith, who was part of the Virginia Beach Lifesaving Service. "My uncle would put me on his 14-foot, 100-pound board with him. As I got older, he would help me take it out and I'd ride it by myself," Smith said of the board now hanging over the exit of Freedom Surf Shop on Laskin Road. "Eventually, I got stronger enough so that I could balance it on my shoulder and control it with my head. "It was a real log." A vibe of surf culture was growing rapidly Virginia Beach and Smith started hanging with the sport's "in" crowd - people like Bob Holland. In 1962, Holland, Smith, Butch Maloney and several other Virginia Beach wave riders traveled to Long Island, N.Y., for a contest at Gilgo Beach. The group did well and found they liked the atmosphere and competition. The following year, the Virginia Beach Surf Carnival was held, drawing more Southern surfers because it was closer than New York. Many from the Gilgo gang attended, and two years later, the East Coast Surfing Championships was born. 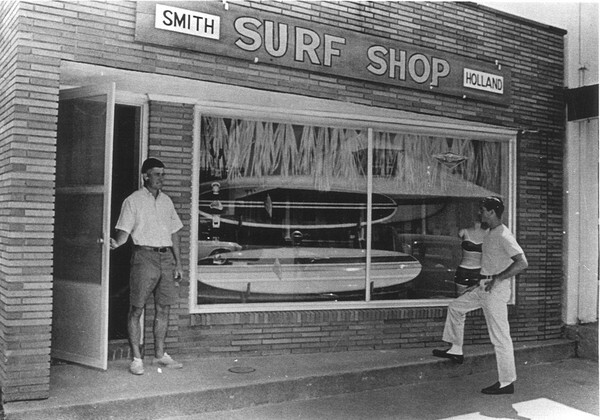 In the early 1960s, the Smith and Holland Surf Shop opened as Virginia Beach's first business devoted to the sport. A couple of years later, a second store open on the Outer Banks. In the late 1960s, Holland got out of the business, keeping the Outer Banks location as a cottage for his family. "He's best known for being a wonderful spokesman and ambassador for the surfing community," said George Desgain, a surfer and judge who has been part of the Virginia Beach surf scene since its early days. "He was the 'Mouth of the South' back in his heyday as an announcer." Wes Laine, arguably the most successful professional surfer to come out of Virginia Beach, calls Smith the "Godfather of Surfing" for the whole East Coast. "He's always been such a gentleman," Laine said. "He's just a super iconic figure."